I have recently received a HomeRight SteamMachine Plus to review . I have used this in our front entryway floor because it does get very dirty . I used the mop part on the floor and then used one of the brush parts around the parts mops will go to. I used this to clean the bathtub and the tiled walls in the bathroom, I used it to clean the oven, the patio furniture, the and vinyl floors , used it to steam the livingroom curtains. I really like that it doesn't take long to heat up and it makes cleaning much quicker so now I get more time to do things I enjoy. It kills 99.9 percent of germ and bacteria including e-coli, salmonella, and staph and don't need some smelly products that give me headaches so I really like that. The handle folds down for easy storage ,plus it has cord wrap on the handle so it doesn't take that much room . 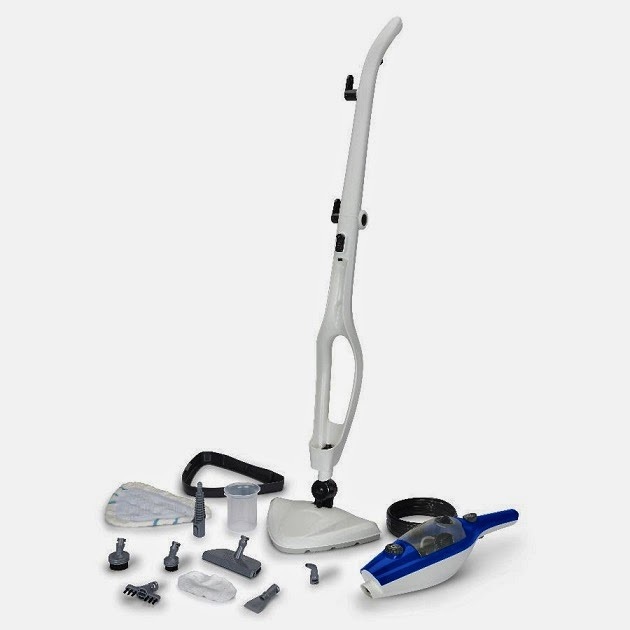 The SteamMachine Plus has a detachable hand-held steamer so it is easy to carry around the house and up and down the stairs. It has 6 attachments are ideal for cleaning and disinfecting stove tops, ovens, grills, counter tops and bathrooms. The suggested retail price is $124.99 but I really think it is worth it. I mean I know I spend more than in a year in cleaning supplies. I highly recommend the HomeRight SteamMachine Plus.